Never lose track of important events: Tresorit Send admin features provide a safeguard to content creators against fraud and unauthorized access. Track link opens, receive notifications or revoke your link any time. After you create a link with Tresorit Send, you will receive a confirmation email with the summary of your link settings. Click the Open Admin Link button to access your admin settings. 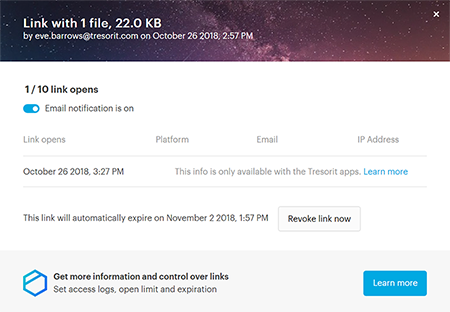 You don’t need a user account to share files with Tresorit Send, therefore your email address is not verified by default and will be removed from our system 14 days after your link expires. Your email address will get verified the first time you open the Admin Link. Every link should be validated this way since Tresorit does not store your settings. With download notifications enabled, you will receive an email every time your link is opened. This is a great security measure that enhances your control shared data. You can disable this feature on your admin link any time. If you didn’t submit your email address to send.tresorit.com, you can suspend your email address from send.tresorit.com to prevent others from using your email without your consent. This way, you email address will be blocked from Tresorit Send and no one can use it to create links. If you suspended your email by accident or just want to use Tresorit Send, contact our support team. They will update your notification settings. Join us as a tester! We are constantly looking for people who can help us better our product — drop us a line, and learn how you can contribute.